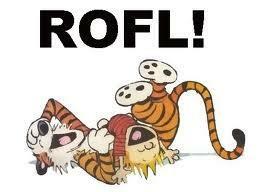 This topic contains 22 replies, has 5 voices, and was last updated by f1nutz 4 months, 1 week ago. 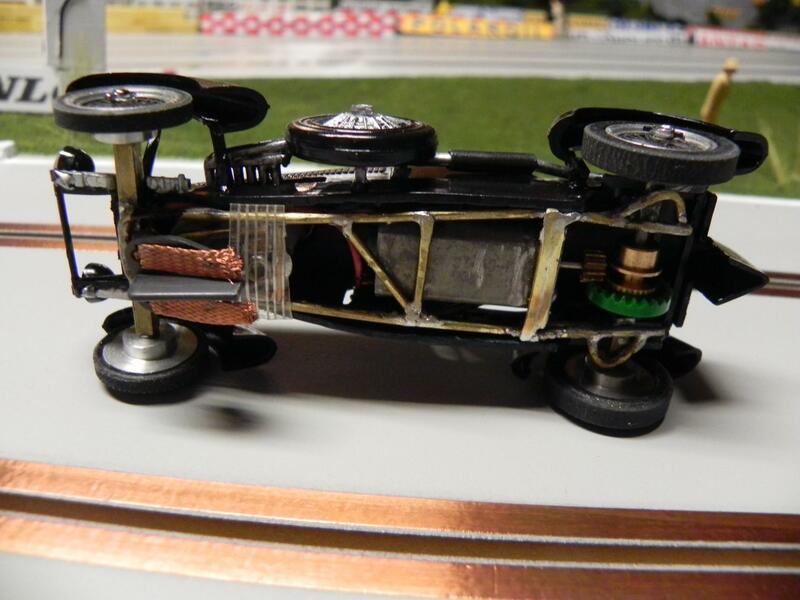 At the Coppa D’oro Trials f1nutz tested/raced one I believe… visit the topic here. Thanks Art. I thought I had seen one on the site. 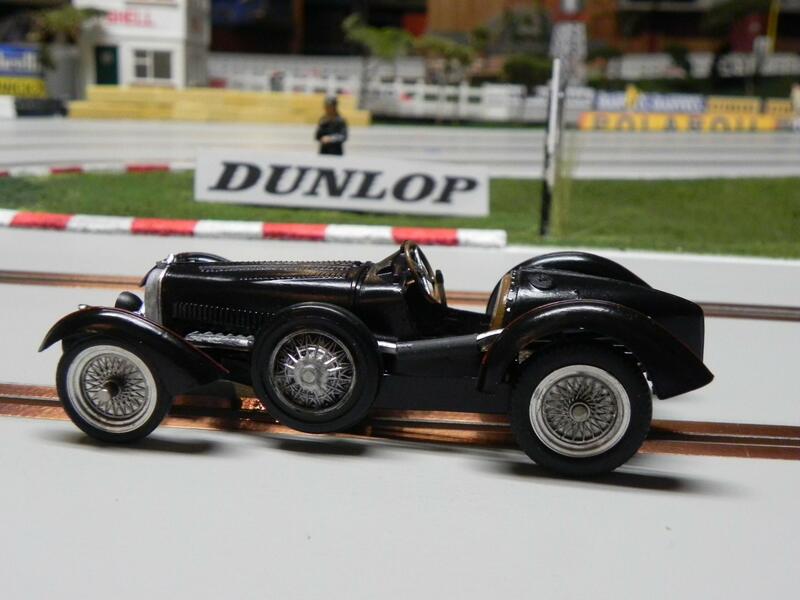 The type 59 was raced in 1933-34, bigger engine, gearbox etc. I believe that f1nutz’s was from the 1926-30 era, though body styles are very close. Yes, I think my wheels would do very nicely on it though will need help with the tires. I’m doing a Type 59 now. Don’t know whether it will be ready for the 22nd or not. No reason not to make yours as well. Certainly the more the merrier!! Thanks Michael, I ordered the kit this morning so realistically it will be a 2019 showing. I am learning towards a black livery but will have to check out if they raced in that color. Go here for lots of Type 59 pictures. Not the most intuitive site to get around in but lots of interesting stuff. Good luck with the build. The Bugattii certainly dominated some grids back in the day so as Michael says the more the merrier! I know there was a black Bugatti (may be a Type 35 I can’t remember) at the Oshawa auto museum. They displayed it at the Toronto Auto show a few years back. Not sure of its race history though. You should take a trip over and check it out if it is still there. 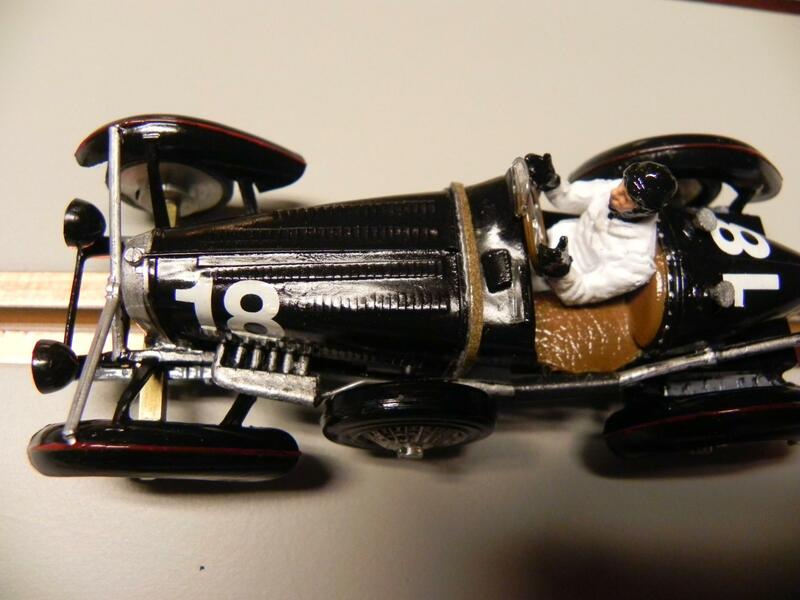 After seeing Jim’s wonderfully finished car, I am encouraged to show the progress I have made on the Bugatti. The main tasks left are the guide system, the motor bracket, decals, final clear and then I can put it together. The wheels are RSslots with Dart tires on the rear. The front tires are RSlots but I will pick up more of Arts. 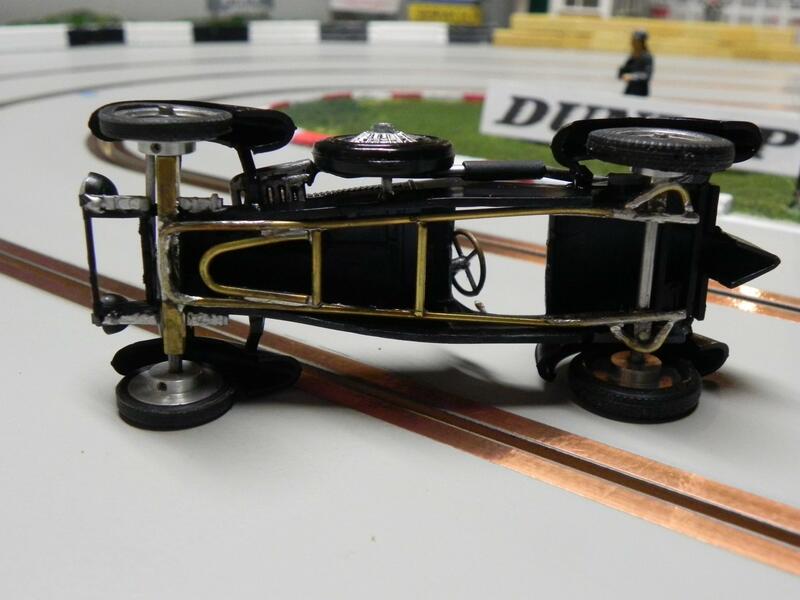 The chassis is brass and one piece which I contoured to the space available. I will have to strengthen the rear axle for sure. I had to modify the exhaust as I didn’t mount the engine, I used a piece of plastic card and drilled all the holes to accept it so it juts out more than I would like. I cut it and linked with a piece of 1/16 piano wire. I estimate the whole car will weigh 65 grams. I am happy with the look using Vallejo paint. I used black primer as well. After the water based paint dries you have to clear it before you can handle it – don’t touch or wipe the paint before hand. 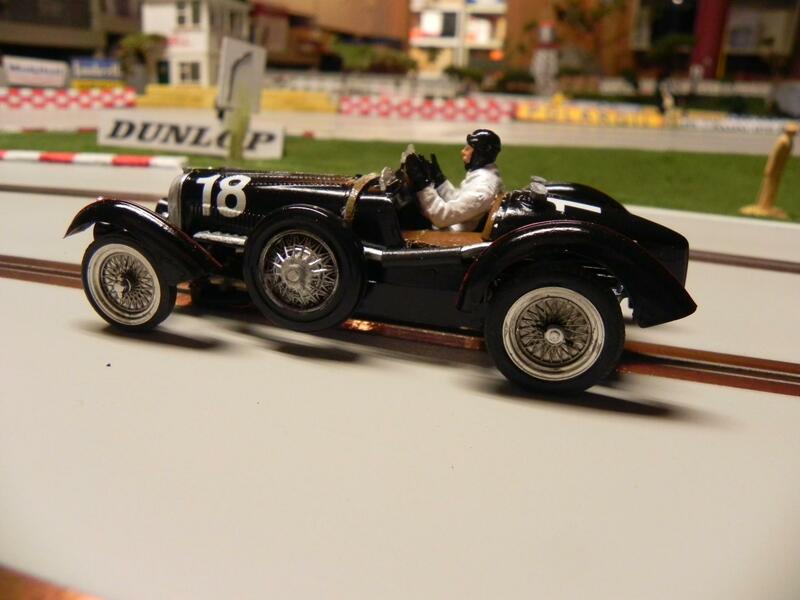 The car will be driven by Achille Varzi, #18, debut in the 1933 Spanish GP with a 4th place finish. The engine is 2.8 L. I believe in 1934 they increased the displacement to 3.3 L? Michael will know for sure. Onward and hopefully upward ………. Excellent!! Looks great with the cycle fenders. 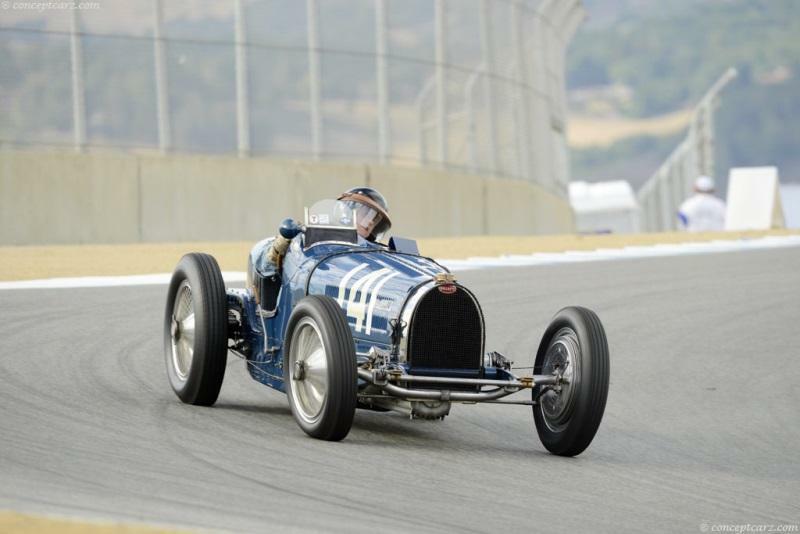 And yes, the original 4 cars built in ’33 had the smaller displacement 2.8L motors from the type 57 and while promising they weren’t up to the Alfas, Mercedes and Auto Unions of the era. 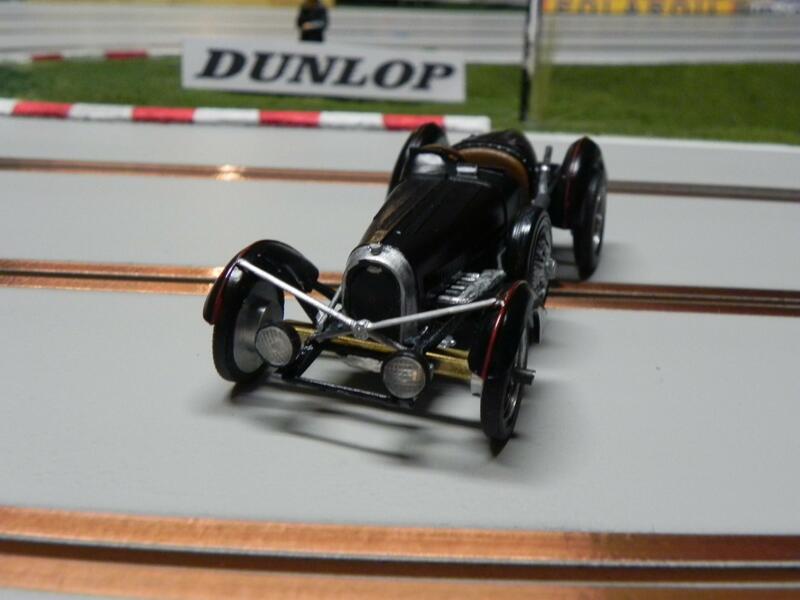 For the 1934 season rules were changed to the 750kg. formula and the cars frames were drilled for lightness and the engines stroked to achieve 3.3L. They were still a bit heavy (749.5kg.) so often they would be pushed to scrutineering minus their magneto just to make weight. Very cool looking car! Nice progress report too. Looking forward to seeing it run. Any progress on the T59 DB? The T59 is now finished – a little later than planned. Weighs in at 62 grams. Art, I will complete the model entry form with all the details. Apologies for not getting out the last few times combination of things. Visited father-in law a few weeks ago, walked in, note on counter saying not feeling well gone to the hospital. Turns out he had a small stroke, but he drove himself, parked illegally as he wouldn’t pay the parking fee — he is okay and now has the medical community all over him as he lives alone. Sorry if that’s too much information. All set for the next Coppa D’Oro. H’mm next project ?? This reply was modified 4 months, 1 week ago by DB. 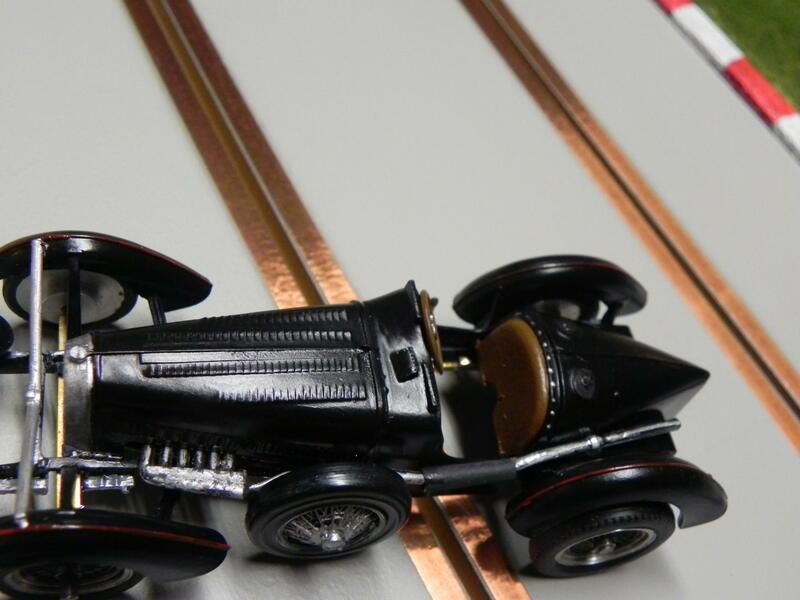 Congrats on finishing your Bugatti DB! Family comes first. I hope your father-in-law makes a full and happy recovery. Please share pics of your build for inspiration? Looking forward to seeing it soon! Nice work Dave! Those fenders and body lines have character. Another great addition to our little group of Pre-war cars. It looks spectacular in black with fenders!! A very interesting looking chassis. Can’t wait to see it in the flesh, so to speak! Came across this on Ebay a while back and just rediscovered it — amazing!! At first I thought “asking almost $11,000 Canadian funds? Not going to happen”. Then I noticed it was not the asking price, but the winning bid after 40-bids! Why is that car worth that kind of money? 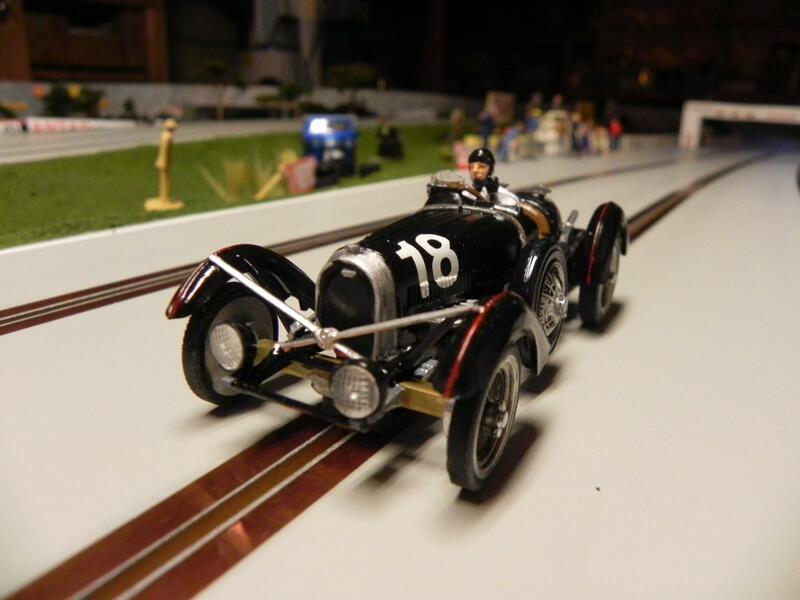 Ken Very few original Scalextric Bugatti’s known to exist. Same with the Auto Union. If you missed the first Bugatti. Here’s another. This one has the original style wire pickups rather than the race tuned guide. Missing the metal bar across the front though. Here’s an auction for a green Auto Union which I’ve never even heard of. Not that that means much. This guy has a bunch of ultra rare stuff.